Nils Noa and Christian Sol’s Troll Records imprint returns with another release of homegrown house from Oslo’s Alex Jangle, featuring two stellar remixes. 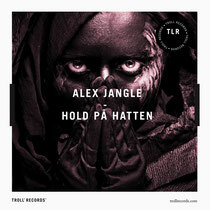 Alex, who has been a key part of Oslo’s underground scene for almost a decade as a DJ, promoter and more recently a producer, steps up with a brand new single of deep percussive house music. He’s released on labels such as Schieber & Southside Shuffle and held residencies both in Norway and in his newly adopted home town of Barcelona. Now his latest release kicks off with the title track ‘Hold pa Hatten’, an epic slice of percussion driven house that uses restrained melodic elements and an infectious bassline to create a rolling groove. Next up is ‘Bib’s Groove’, a perfect accompaniment to the opening track, with a similar percussive vibe. This time the Latin rhythms come to the fore and meld with synth stabs, tight vocal edits and Fx to deliver an energetic underground workout. The first of the two remixes comes from label boss Christian Sol who strips back the drums and turns in a rolling slice of house, that draws its essence from an incessant bassline and the cleverly used vocal snippets. Finally, Denmark’s Tim Andresen delivers a deep version that uses strings and Rhodes keys to great effect, producing a mix that is certain to be a favourite in the months to come. It’s out February 2012.